I was thrilled that our own Cape Town City was crowned the Global Earth Hour Capital winner for 2014. 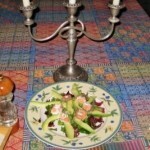 For my contribution to Earth Hour I decided to create a recipe that did not require any electricity to prepare. I lit plenty of candles, poured myself a glass of Krone Borealis to celebrate the event and prepared and ate my recipe by candle light. 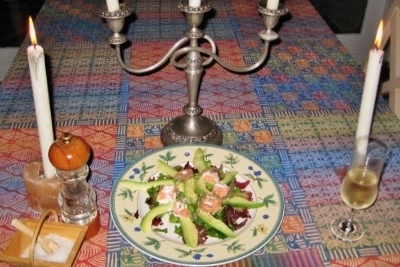 This recipe is quite delicious, the Petit Suisse fresh cream cheese from Normandie harmonises perfectly with the smoked salmon and the avocado dressed with lemon juice offers a counter balance to the creaminess. This recipe can be served as a starter or main course. Prepare the vinaigrette: Put a ¼ teaspoon of fine salt into a small bowl. Pour in 1 tablespooon Burgundy white wine vinegar and stir until the salt has dissolve. Add 3 tablespoons of Hazelnut oil and whisk into a homogenous smooth dressing. Cut into bite size pieces if the leaves are large and place in a large salad bowl. Lay out the slices of smoked salmon on a flat board. Remove the paper wrapping and place the cheese in a bowl. Carefully spread a thick layer of cream cheese across one side of all the smoked salmon slices. Roll the smoked salmon lengthways to form a roulade (sausage shape). Use a very sharp knife to carefully slice the roulade into narrow rings. Thinly slice the avos lengthwise and sprinkle with lemon juice. Add the vinaigrette to the salad and toss well. Decorate with a sprig of fresh thyme.